Createspace Independent Publishing Platform, 9781981169603, 184pp. Not all goblins are bad. Even so, Ben is not trusted in his new home of Saint Louis. The Green Watch is following him, humans make a wide path as he walks by, and he's not even allowed inside the city library. However, even though most of the city is wary of him, Ben's life among humans is a vast improvement over his old one. When he finds a book that may hold the secret to his abnormality, Ben will stop at nothing to get a look at it. With the help of two new friends, he soon discovers, however, that his search is hopeless. His only option is to travel out of the relative safety of his new home to a mysterious market known, among certain circles, for harboring rare and mystical goods. But what Ben finds is even more startling than he expected. The second in a series of short novels set in Saint Louis in the early 1900s and based on the 13th century Latin tale, The Benevolent Goblin. David McElroy is a writer and designer who has been creating stories in one way or another since childhood. 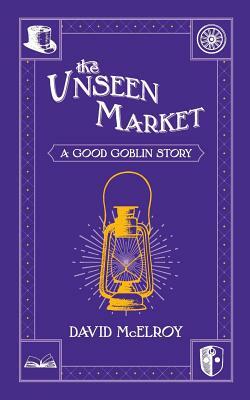 A chance pickup at an elementary school book fair began his fascination with goblins, and he's always believed they could be more than simple fodder for stalwart adventurers. He lives in Lebanon, IL with his wife and daughter.